Be the first to share your favorite memory, photo or story of Rosia. This memorial page is dedicated for family, friends and future generations to celebrate the life of their loved one. Rosia Beatrice Demons Mason was born on Saturday, February 4, 1922 in McDuffie County, GA Eddie & Lula Demons. She was a very proud and dignified woman. At a young age, she was baptized and joined the Springfield Baptist Church of Thomson, GA under the leadership of Rev. Whitehead. She received her childhood education by attending school in McDuffie County, GA. After graduating high school, Rosia married William Mason. 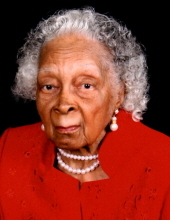 They relocated to Charlotte, NC where she lived for over 60 years. While living in Charlotte, Rosia began attending the Mayfield Memorial Missionary Baptist Church initially under the leadership of Rev. H. S. Diggs. She changed her membership, and became a faithful member for over 50 years. A devoted daughter, sister and auntie; Rosia took all these roles to heart, and most importantly…she loved all of her family. Whether it was Thanksgiving Day or the Christmas Holidays, Rosia would travel back to GA every year to spend quality time with her siblings. She would also travel back to Thomson every year to celebrate the Springfield Baptist Church Anniversary with her sister and church family. In 1992, she relocated back to GA to take care of her only sister, Gertrude Jones. Once residing back in Thomson, Rosia rejoined her home church, the Springfield Baptist Church in Thomson, GA.
She was thoughtful and giving. Rosia always went the "extra mile" for her family. She loved Floyd & Bernice as if they were her own children; and in return, they expressed their love and kindness to her by always going the "extra mile" for her. On Saturday, January 26, 2019, our beloved Rosia made her earthly departure from this life as she knew it, only to make her heavenly arrival to rest forever more in the bosom of Abraham. Although she will be greatly missed, she shall live forever in our hearts and memories. Rosia B. Demons Mason is preceded in death by her husband, William Mason; her parents, Eddie & Lula Demons; four brothers, Tommy Demons, Issac Demons, Floyd Demons, Sr. and Leon Demons; one sister, Gertrude Jones. Those left to cherish her wonderful memories are: a devoted nephew and a devoted niece, Floyd Jr. & Bernice Demons of Thomson, GA; two additional devoted nieces, Louise Jones Ellis of Ft. Washington, MD and Janice (Marvin) West of Thomson, GA; a brother-in-law, Welcome Mason of Lincolnton, GA; the only first-cousin that’s living, John Albert Demons of Fort Valley, GA; a host of additional nieces, additional nephews, great-nieces, great-nephews, great-great-nieces, great-great-nephews, additional cousins, other relatives and friends. To send flowers or a remembrance gift to the family of Rosia Beatrice Demons Mason, please visit our Tribute Store. "Email Address" would like to share the life celebration of Rosia Beatrice Demons Mason. Click on the "link" to go to share a favorite memory or leave a condolence message for the family.